If you are one of the more than 500 million users on twitter, you know how great it is for keeping in touch with friends, celebs, and industry types. 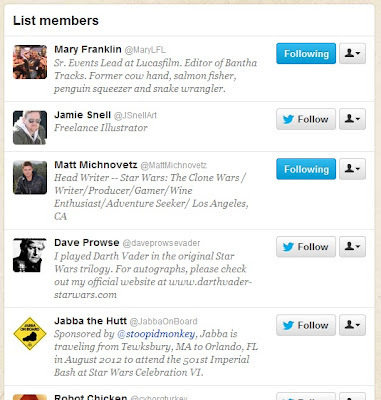 The list of Star Wars personalities that have joined the flock is growing every day. After looking for a list of the best people to follow, I set out to create my own filled with cast, crew, artists, licensees, legion groups, and more. With more than 150 people and months in the making, the Star Wars Uber List is now the one of the most inclusive yet focused lists on twitter. You won't find any accounts of "characters" in my list; no Yodas, Darth Vaders, or Damn Batmans here. I also don't include every single fan who tweets about Star Wars. I call it my Big List of Big Names. That means real people or organizations who have worked in the Star Wars community. If you want a special look into the inner workings of Lucasfilm, want to be the first to know about your favorite artist's latest project, or want to be on top of events from legion units around the world, check out my Star Wars Uber-list on twitter.